Overview: the sun is the ultimate source of energy for most living organisms. Plants harness the solar energy through photosynthesis and use this energy to make glucose. This glucose is then used in respiration or to make other cellular structures. This biomass is then transferred through an ecosystem when one organism eats another e.g. grass → rabbit → fox. The arrow shows the direction in which energy/biomass is transferred and all food chains begin with a producer, so called because they produce their own food. 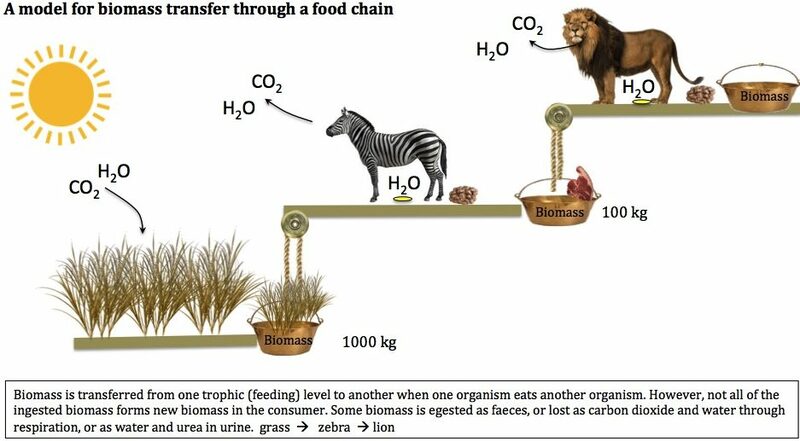 As biomass is transferred between trophic levels (trophic comes from Greek ‘to feed’) most biomass is lost (about 90%) through excretion of urine and faeces and waste gases from respiration. Only some of this biomass (about 10%) is incorporated into new tissue. Key concept: energy from the sun is captured by plants through photosynthesis and used to make glucose which is then used in respiration or to make new cells (biomass). Some of this biomass is passed along a food chain when one organism eats another. The majority of this biomass though (~90%) is wasted at each step. Before we get stuck into food chains and food webs, it’s important that students have time to explore habitats and organisms first. Videos or setting homework to explore the animals of the Serengeti work well. If biomass is lost through a food chain, why are secondary consumers generally bigger than primary consumers? Why can a vegetarian diet support more people per tonne of producer? Does a food chain have to start with a living organism?